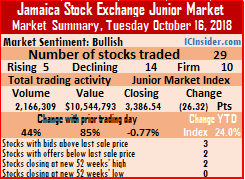 Trading on the Junior Market closed with an exchange of 29 securities, compared to 26 on Friday , ending with 5 securities rising 14 declining, while 10 remained unchanged, leading to the market index declining 26.32 points to close at 3,386.54. Market activities, resulted in an exchange of 2,166,309 units valued at $10,544,793, compared to 1,506,696 units valued at $5,686,695 on Friday. IC bid-offer Indicator| At the end of trading, the Investor’s Choice bid-offer indicator reading had 3 stocks ending with bids higher than their last selling prices, while 2 closed with lower offers. Trading closed with an average of 74,700 units for an average of $363,614 in contrast to 57,950 units for an average of $218,719 on Friday. Trading for the month to date averages 76,601 for an average of $357,960 compared to averages of 76,799 for an average of $357,368 previously. September, ended with an average of 484,335 at $2,628,299 for each security traded. 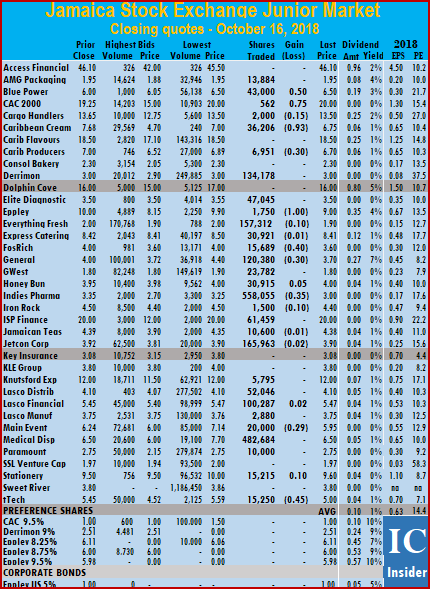 At the close of trading, AMG Packaging ended at $1.95, trading 13,884 stock units, Blue Power concluded trading of 43,000 units, ending 50 cents higher at $6.50, CAC2000 finished trading 562 shares with a rise of 75 cents to end at a 52 weeks’ closing high of $20, Cargo Handlers lost 15 cents to settle at $13.50, with 2,000 shares changing hands. Caribbean Cream fell 93 cents and ended trading 36,206 shares at $6.75, Caribbean Producers lost 30 cents in closing trading at $6.70, with 6,951 units, Derrimon Trading ended $3 trading 134,178 shares, Elite Diagnostic traded 47,045 stock units at $3.50, Eppley closed with a loss of $1 at $9, with 1,750 units changing hands, Everything Fresh traded 157,312 shares and fell 10 cents to close at $1.90, Express Catering fell just 1 cent and ended trading with 30,921 shares at $8.41, FosRich Group lost 40 cents in trading 15,689 shares to close at $3.60, General Accident declined by 30 cents and finished trading 120,380 shares at $3.70, GWest Corporation closed with 23,782 stock units changing hands at $1.80, Honey Bun rose 5 cents and ended at $4, in exchanging 30,915 units, Indies Pharma shed 35 cents and ended with 558,055 shares changing hands, to close at $3. Iron Rock concluded trading of 1,500 shares after declining 10 cents at $4.40, ISP Finance finished trading of 61,459 shares at $20, Jamaican Teas shed 1 cent to close at $4.38, with 10,600 shares changing hands. Jetcon Corporation lost 2 cents and ended trading 165,963 stock units at $3.90, Knutsford Express closed at $12 while exchanging 5,795 shares, Lasco Distributors ended at $4.10, in trading 52,046 shares, Lasco Financial rose 2 cents in concluding trading of 100,287 stock units to close at $5.47, Lasco Manufacturing finished at $3.75, with 2,880 units changing hands, Main Event settled with a loss of 29 cents at $5.95, with 20,000 shares trading,Medical Disposables ended trading at $6.50, with 482,684 shares, Paramount Tradingclosed with the trading of 10,000 shares at $2.75, Stationery and Office rose 10 cents and finished trading of 15,215 stock units at a record closing high of $9.60 and tTech shed 45 cents in trading 15,250 shares at $5.